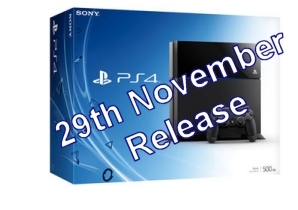 Sony has confirmed that's it's new PlayStation 4 console will be released throughout Europe on Friday 29th November 2013. In the UK it will cost £349. In the United States it will be 2 weeks earlier on the 15th November. Sony made it's official announcement at it's pre-Gamescom press conference in Cologne, Germany. Microsoft have yet to confirm an actual dates for it's Xbox One, other than it will be during November 2013. Pre-Orders for the PS4 have been extremely strong with many retailers no longer taking orders. With the Christmas shopping rush stock shortages are a possibility.